Premier Michael Dunkley and Minister of Economic Development Dr Grant Gibbons hosted various business leaders and community representatives at a reception at City Hall yesterday to announce the launch of the RCA Bermuda Compliance Certification Programme [RBCC]. This educational and training initiative was first announced in January 2015 as a partnership between the Bermuda Government, the Bermuda College and the Regulatory Compliance Association [RCA]. The RCA is an educational organization headquartered in New York that offers accredited, post-secondary education in relation to investment and financial services with a focus on regulation, law and practice, compliance, and examinations and enforcement. In conjunction with the partnership, the RCA has donated a total of 150 scholarships for qualified applicants to enrol in the Bermuda programme. 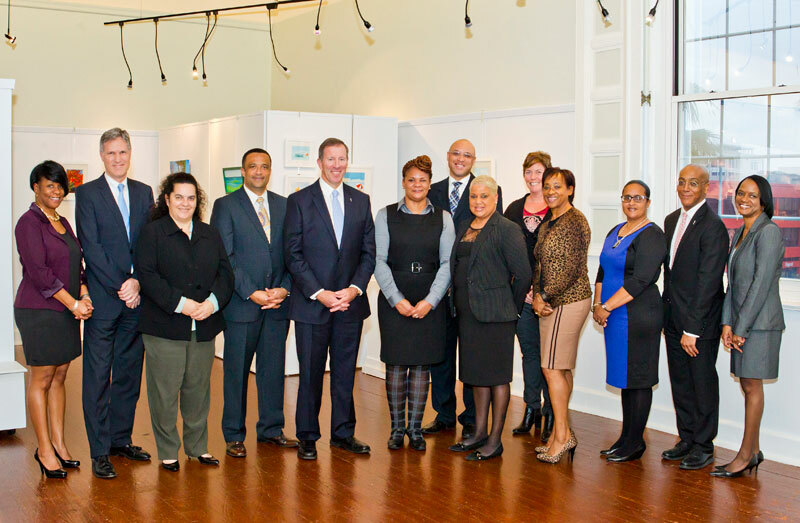 Premier Dunkley said, “This programme is the first of its kind in any offshore jurisdiction. Its ultimate success will be achieved through the continued support and active engagement of the Bermuda business community.” The Premier also encouraged Bermuda businesses to value the programme’s professional certifications when recruiting for compliance roles. “For those students in the programme that do not have prior experience in compliance, we need employers to create opportunities that will allow them to gain experience through internships, apprenticeships or other positions that will enable growth over time,” stated Minister Gibbons. While the RCA’s compliance courses are typically aimed at graduate level students, the RBCC was specifically designed for Bermuda and does not require an undergraduate degree. Development of the programme was aided by local compliance experts as well as feedback from participants of a pilot session. Relevant work experience; or a relevant professional certification. Additional eligibility requirements for full scholarships will apply. “RBCC courses will be online and self-paced. Based on the structure of the programme, students can obtain Diplomas, Advanced Diplomas and professional certifications in compliance with specific areas of concentration. The overall cost will depend upon the diploma level or certification pursued and will range from $1,750 for a first level diploma to $8,000 for the most senior professional certification,” a spokesperson said. “The RBCC start date is April 11, 2016. Applications to register and begin on that date must be submitted to the Bermuda College by March 11, 2016. “Those individuals applying for scholarships for the April start date must submit their applications by February 28, 2016. As the programme will be online and self-paced, students will have the flexibility to start the programme at a later date. The College website does not have any information.